The monument of Walter Stewart, Earl of Menteith and his wife Mary, sculptured from the same block of stone, are unique representations of a man and wife in the United Kingdom. Although very damaged both effigies lie on their sides facing each other, each with an arm extended, embracing each other around the shoulders. They are both portrayed together as an image of true love and devotion, an amazing illustration when we are so used to looking at the standard knightly and female posture, with the hands held in prayer and the knight handling his sword. 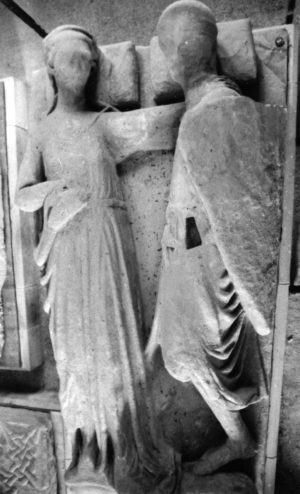 In England the closest we get to this type of loving devotional image between couples is on a small number of effigies, where a hand holding pose is represented; for instance King Richard II and Ann of Bohemia in Westminster Abbey also Ralph and Katharine Green at Lowick, Northamptonshire. Walter is represented cross-legged, with the head resting on a single rectangular cushion, wearing a coif, long surcoat and with a large shield on his left arm with his coat-of-arms in relief: a fess chequeé with a label of five points. Walter was the third son of Walter, third High Steward of Scotland. He was invested in the lands and title of the Earl of Menteith in right of his wife Mary, daughter and heir of the Earl of Menteith. He appears to have died about 1296 and his wife 1286 with the monument probably dating between c.1280-1300. The reason for the damaged condition is that the monument was exposed to the elements but now it is preserved in the remains of the chapter house together with other monuments. Inchmaholme Priory is in the custodianship of Historic Scotland and lies on a small island on the Lake of Menteith and is only accessed by a small motor boat ferry from a nearby jetty. The island and the surrounding area is one of the most picturesque places one can ever visit. After visiting the priory the afternoon or evening can be take up by sitting outside the hotel, watching fly-fisherman, and the amazing sight of Ospreys from the Menteith Hills gliding over the lake.